We Manufacture and Supply high quality Wedge Wire Screens that are made from looped wires formed into a deep wedge-shaped section. According to buyer’s needs, we can make available Wedge Wire Screen in various shapes and forms including flat panels, curved sieve bends, conical baskets and cylinders. Our testing team ensures that Wedge Wire Screen passes all quality checks before supplying. 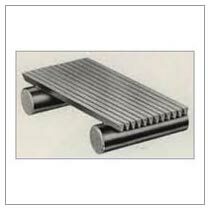 Our clients trust us for delivering only premium Wedge Wire Screen at reasonable price. We always deliver all orders on time. Free Clearance : The wedge-shaped sections of the wire from aperatures that become progressively wider in a downward direction, thus ensuring rapid flow of material through them. Clogged and blinded aperatures are reduced to an absolute minium. Lateral Strength : In our opinion no form of screening surface witl i apertures as fine as those of wedge wire screens, can compare with the mechanical strength and working efficiency of wedge wire. Percentage Open Area : For a given aperature size, wedge wire screens have a much larger percentage of open area than conventinal sieves. Wearing Life : Owing to a greater wearing area being provided by hat top surfaces, wedge wire screens retain their aperature for a longer duration than round wire screens. Looped Wedge Wire Screen construction is particularly recommended when high Vibration resistance and fine accurate aperture are needed. Coal and Coke Washeries : Flat and curved wedge wire screens and Centrifuge Baskets with suitable re-inforcements are used for dewatering processes on stationary and moving frames, suction filters and centrifugal driers. Ore Beneficiant Plants : In Iron and other Ore benificiant plants, wedge wire flat screens, Curved screens and Centrifuge baskets of fine and very fine aperture are used for efficient Dewatering and recovery of fines. Sugar Mills : Flat, curved and cylindrical wedge wire screens are used for Juice Filtration and Bagasse Separation drainage in tanks in conjunction with scraper conveyors as well as for draining crushed sugar cane supply in D.S.M. Screens. Cement, Chemical and Fertilizer Plants : Flat panels, Curved wedge wire screens, Cylinders and Centrifuge baskets with cylindrical type, conical type and pusher type have many and varied applications in these industries. Cellulose, Wood and Straw Pulp and Board Industries : Wedge Wire cylinders, Flat panels and Centrifuge baskets are used for preliminary screening for knot catchers and for efficient fibre recovery Wedge wire screens ensure greater efficiency than the conventional perforated or machined slotted plates. Sewage, Effluent and Water Treatment : Flat wedge wire decking in final settlement tanks provides tertiary treatment for the reduction of suspended solids. It is also the medium used in a technique for the consolidation of sludges where the rate of filtration is controlled at low operating pressures. Sewage, aluminium hydroxide, iron hydroxide and other industrial sludges are being successfully dewatered on wedge wire. 7.6mm diameter cross rod at 70mm pitch. 12mm diameter cross rod at 70mm pitch. 7.6mm diameter cross rod at 66mm pitch. 12mm diameter cross rods at 66mm pitch. 5mm diameter cross rod at 70mm pitch with two spacing lugs on the profile wire. 5 mm diameter cross rod at 66mm pitch with two spacing lugs on the profile wire. © Copyright 2009 - 2010. Hind Screens.